The chilly weather is here and it just sounds SO good to wrap up in a blanket - RIGHT?! 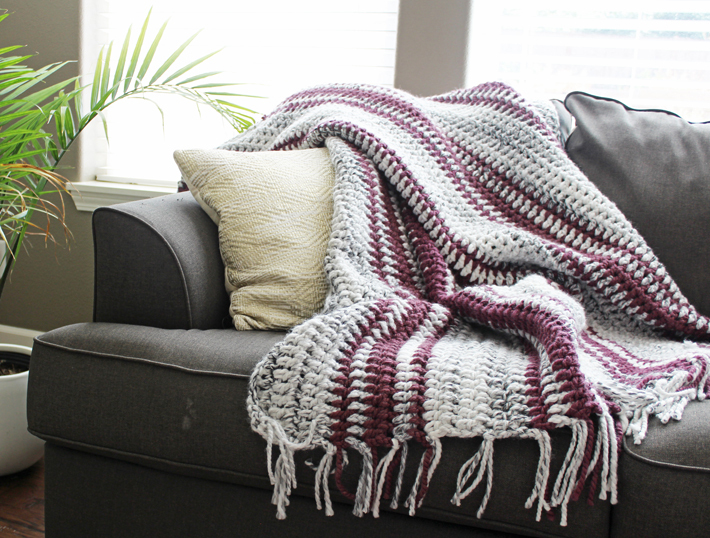 Jessica here from The Hook Nook again, and I have been so antsy to work up a nice, large blanket that my kiddos and I can snuggle up in together on those cool mornings. I’ve been having so much fun playing with different designs and wanted to make something easy enough to still be mindless crochet work, but offer enough interest to allow the final product to be just totally stunning. I’m pretty happy with this project! While at my local Jo-Ann Fabrics and Craft Store, I fell in LOVE with this Lion Brand Wool-Ease Thick & Quick in the color Marble. I loved how neutral and beautiful it was and with the gray tones throughout, it offered really beautiful details which added to the final design. I chose to use a secondary color (same yarn but in color Eggplant) to be able to do a fun stripe pattern! 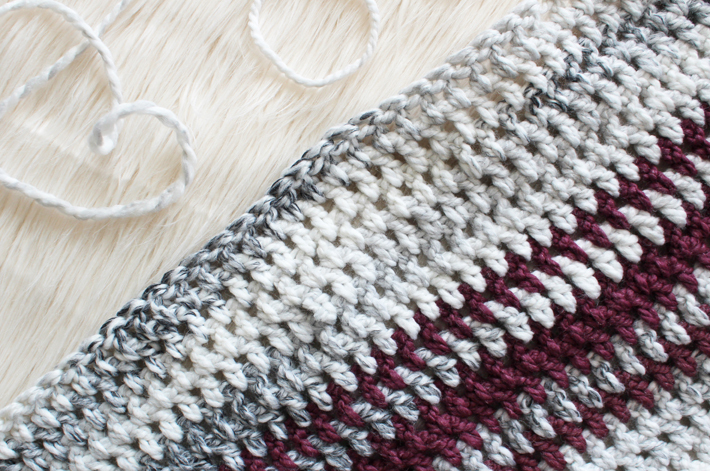 Stripes may feel scary or difficult if you’re new to crochet, but don’t be afraid! Super super easy!! You go this! 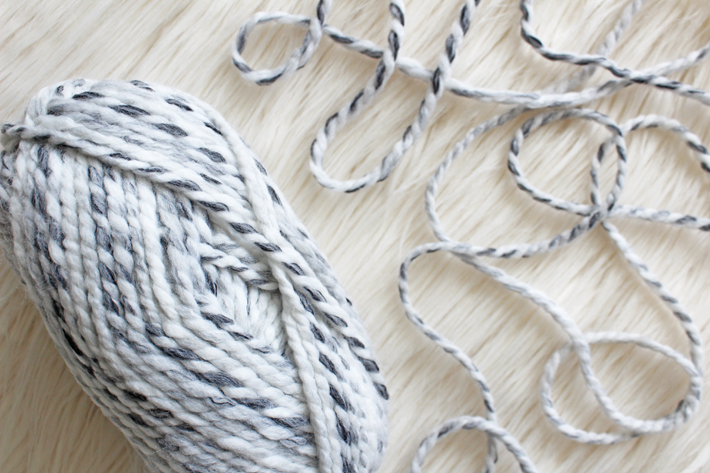 To make stripes easily, simply finish the row with Color A (in this case, Marble) and finish off (cut the yarn and pull the yarn through to secure the knot). To add your new color, attach Color B (in this case, Eggplant) to your hook using a slip knot. 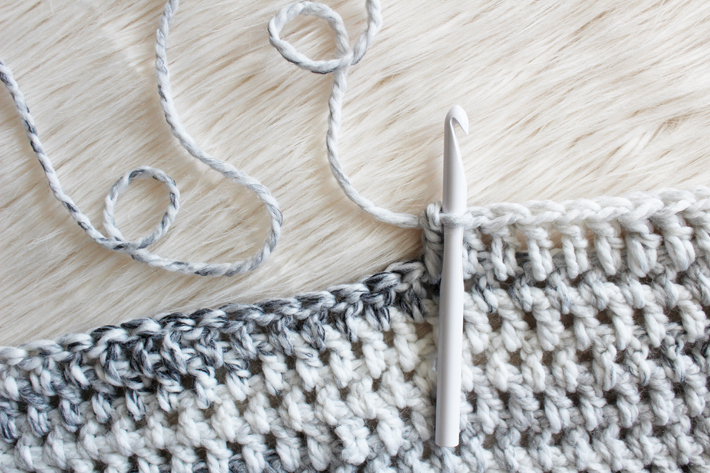 Slip stitch your new yarn to the last stitch you made using Color A. Chain one and then continue on as normal! Ta da!! Easy peasy!! 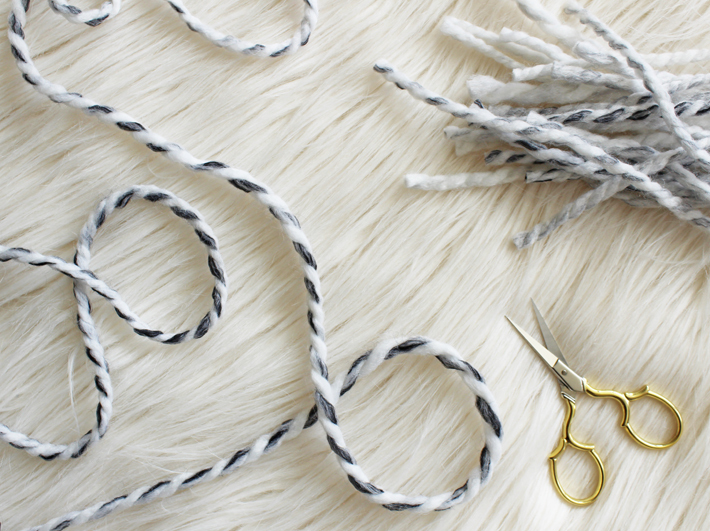 Just don’t hate me with how many ends you’ll be needing to sew in with this method - but good thing we are using those ends as fringe for this project so no weaving in ends! Woohoo!! For this pattern, we will be working the entire blanket in double crochet (DC) stitches but we will be placing the stitches in a slightly different space. Instead of placing your hook into the “v” like a normal stitch, we will place it just below the "v" into the open space of the stitch. This just offers a fun zig-zag look with the color changes, but do feel free to work the DC stitches in the proper place if you are uncomfortable. Your blanket may end up slightly larger than mine if you choose to do this (but that’s definitely not a bad thing!). With Color A, CH 102. 3. Repeat Step 2 for a total of six MDC rows. Finish off. 10. Repeat Steps 3-9 for a total of five Color B sections. Ta da!! Now you have one huge blanket with a million yarn ends!! I personally don’t really enjoy weaving in ends, so I decided to pretend these were all fringe. Ha! I wanted to add more fringe (because why not?!) so I took my last skein of Color A and cut 72 strands, each approximately 10” long. 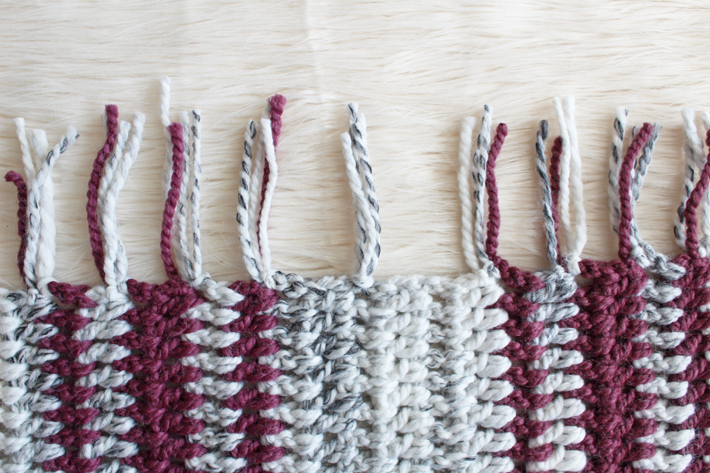 To attach strands to the blanket, check out this awesome blog post I found explaining how to do it! I had so much fun with this project and I really hope you do as well! Be sure to post your progress (and finished piece!) to social media and use #thehooknookers for all of us to see! 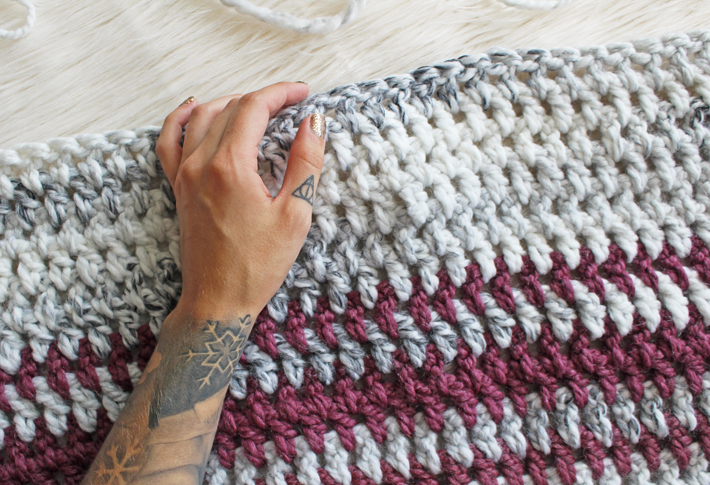 Want to use different yarn for this blanket? Check out some of these other amazing bulky options!